A technical midlayer designed to insulate and breathe during cold, high-output days up in the mountains, out on the slopes or on the trails, the Men’s Descender Vest provides essential core warmth without inhibiting movement. It's made with Icebreaker's 240gm textured terry corespun fabric, which features merino wool fibers wrapped around a nylon core, for increased durability and strength while retaining next-to-skin softness. The Descender Vest is quick-drying and the right choice for effective layering. It features a high-loft brushed back with heat-trapping channels to help regulate your temperature during technical high-exertion pursuits like skiing, climbing or running in cold conditions. Lighter-weight side panels help manage moisture and dump excess heat when you’re moving fast, and the zippered chest pocket with media cord port keeps your music flowing or stashes small essentials. Descender Vest- Mens is rated 4.9 out of 5 by 10. Rated 4 out of 5 by Bowron from The vest I've been waiting for (almost) My only issue with this vest is that it seems to run on the small side. I've been wearing IB products for years now and have comfortable in size medium. This vest in a medium however is very much on the small size and is borderline too small. Is very form fitting and doesn't leave much room for a layers under neath. Also a little on the short side so anyone with a longer torso may want to consider going a size up. Other wise it is all the great things I've come to expect from IB - quality, style, & functionality all in one piece. Rated 5 out of 5 by Lekili from Icebreaker rocks! When searching for the perfect clothing to bring to Peru to hike the Inca Trail to Machu Picchu, I discovered Icebreaker. It's the most flexible, warm, wicking, odor resistant clothing I've ever experienced. Since then I've added to my Icebreaker collection and now it's part of my every day. THANK YOU! Rated 5 out of 5 by MountainPhotographer from Fantastic Fit, My New Favourite This vest is a perfect fit for me at 5'7" and an athletic build. I wear it over an Icebreaker t-shirt and 200gm long sleeve shirt and it is perfect for trekking anywhere. It fits over as if there isn't any extra size but it is much warmer with it. I love it and have been wearing it daily. Rated 5 out of 5 by Travelingbug from Versatile vest that looks great in every situation A gift for my husband and the fit was perfect and the weight was so comfortable for him.He is a large normally and this large fit him perfectly. He loved how the vest looked at work in a admin school setting and the weight kept him warm on yard duty yet comfort able inside. A great vest and a great purchase. He loves it! Rated 5 out of 5 by Shipman from Perfect for my trips to the Arctic + MTB! The Icebreaker gear including this vest is what I always use during my trips to the Arctic, winter or summer. 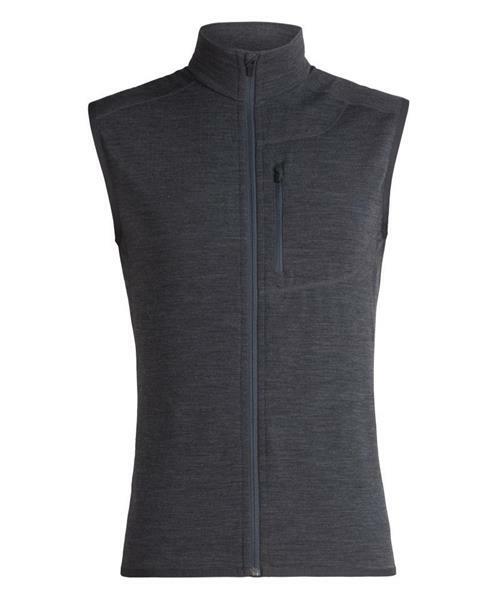 This vest compliments the rest of my gear in the office on a cold days as well as during my outdoor activities (cross country skiing, snowboarding or winter biking). Rated 5 out of 5 by SandmanAB from 2nd vest this is my second descender vest. I already have a blue/green one. I bought this grey one to wear under my blazer on cold mornings. can dress it up or down on the weekend. Rated 5 out of 5 by SandmanAB from Perfect extra layer I stuff this vest in my briefcase and backpack It's light and takes up hardly any room. but it packs a lot of warmth in a pinch for a small piece.